Shopping for Lost in Space Lunch Boxes? Limited edition lunch box based on the Lost in Space sci-fi TV series. Brand-new retro-style art by Chris White. 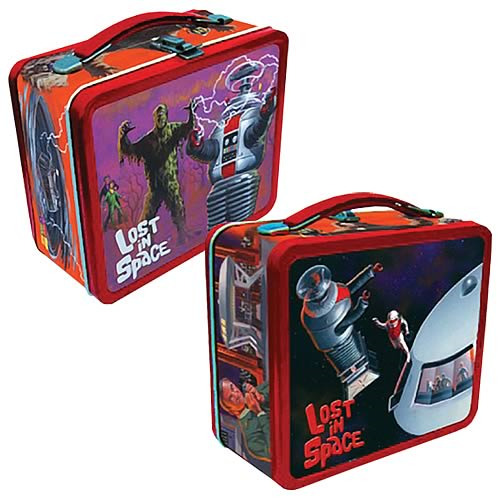 Bring home some old-time sci-fi with the Lost in Space Lunch Box! This lunch box is a limited edition of 5,000 pieces and is surely a true collector's item. It measures 7-inches tall x 7 1/2-inches wide x 4-inches long. The lunch tote features the Robot, Dr. Smith, the Jupiter 2, and the Robinsons in brand-new retro-style art created by illustrator Chris White. Your lunch won't get lost with this!